Courtesy of Live NationHere’s wishing a supremely happy birthday to Diana Ross, who turns 75 today. As previously reported, the Motown legend will be celebrating the milestone with a special concert Tuesday evening at the Hollywood Palladium in Los Angeles. 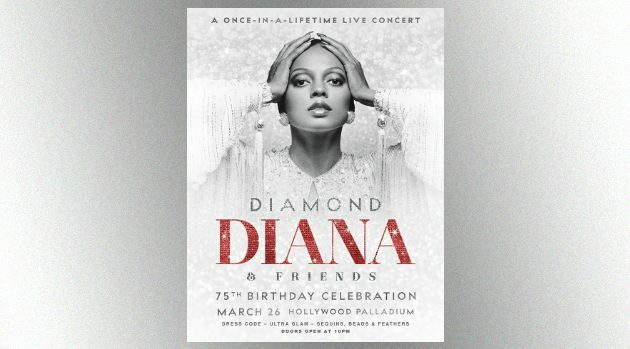 The show, called “Diamond Diana & Family & Friends 75th Birthday Celebration,” will feature the former Supremes frontwoman performing classic songs by her old group and from her solo career. As the name of the event suggests, Ross will be joined by family members and special guests at the bash. Another way fans can celebrate Diana’s 75th birthday is by attending a screening of the film event Diana Ross: Her Life, Love and Legacy, which will be shown at a variety of theaters across the country. The movie features footage from the concert film Diana Ross: Live in Central Park, which documents the historic free concert Diana gave in New York City over the course of two days in July 1983, and also includes new tribute messages from Diana’s children. On July 21, 1983, about 450,000 people turned up at Central Park’s Great Lawn to see Diana perform, but a lightning storm forced the event to end early. Ross promised from the stage that she would return to perform a full concert the next day — which she did, delivering an inspired, career-spanning set to a crowd of about 350,000. Additional screenings of Diana Ross: Her Life, Love and Legacy also will be held in theaters this Thursday, March 28. Visit FathomEvents.com for more details.